Makeup Revolution seem to be on fire at the moment... They're original revolutionary priced makeup line has definitely proved popular with all of us makeup and beauty lovers and if that wasn't already amazing enough they have recently released some gorgeous new makeup for us all to feast our eyes on and drool over ha ha. 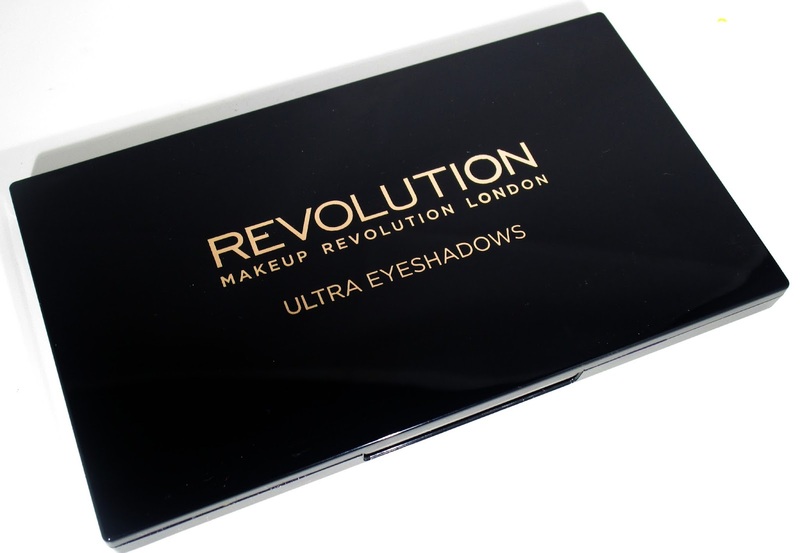 Over this past weekend the excitement continued as Makeup Revolution treated us even more by releasing two brand new ultra eyeshadow palettes each containing 32 beautiful eye shadows for just £8.00 each... that works out at just 25p per eyeshadow, wowza!! 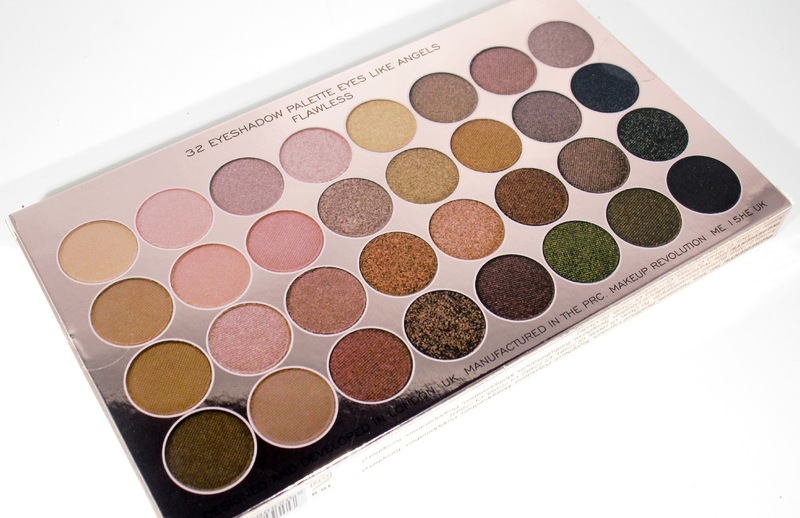 As I said before Makeup Revolution have released 2 new 32 piece Ultra Eyeshadow Palettes, one of which is called Flawless*, which is aimed towards all of us neutral loving gals out there and the other is cutely named Eyes Like Angels, which is crammed full with a mixture of brights, pastels and smoked shades, perfect for the summer loving gals he he! 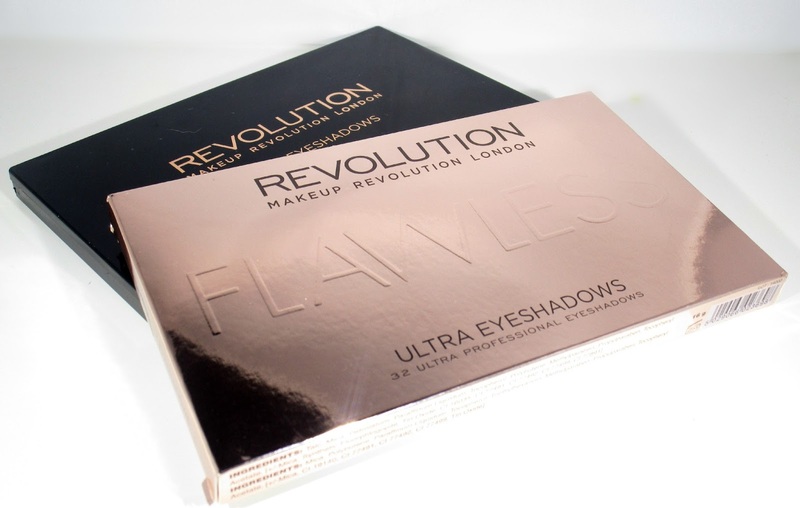 The Makeup Revolution Flawless Palette comes packaged in a Rose Gold cardboard box which I think is super pretty, but then anything Rose Gold lures me in and is always a winner for me ha ha, the palette itself has a sleek looking black casing with a lovely large mirror inside the pull up lid which is always handy. When you open up the Flawless Palette you are met with 32 small panned eye shadows in so many neutral hues with a mixture of matte, shimmer and metallic finishes, trust me this palette will have you oohing and arrhhing when you open it for the very first time as that's exactly what I was doing he he. I must admit I haven't experimented or played around with this palette alot just yet because its fairly new to me and I will be doing a full review in the next few weeks, but what I can say is that all of the eye shadows I've swatched so far have felt lovely and soft in the pan and are packed full of pigmentation, I have a sneaky suspicion these will blend out beautifully too because when swatching them the eyeshadows seem to blend out on my hand lovely. All in all I think this is another awesome release from Makeup Revolution and I can see myself getting so much use out of it as there's just so many shades to play with and so many looks that can be created, I've even been forward thinking of just how stunning these shades will look in Autumn, ekkk! 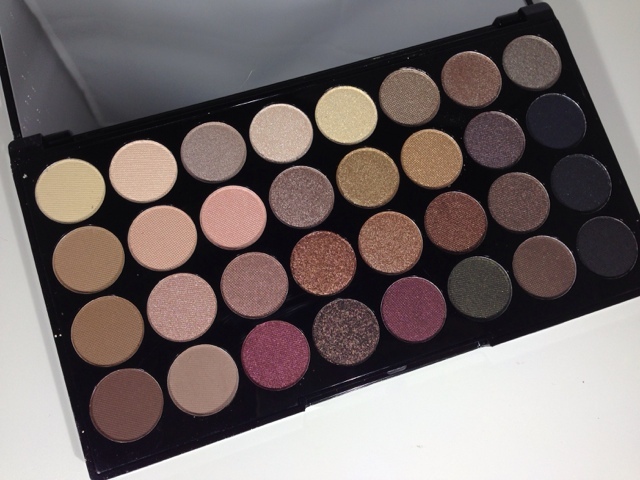 So if your looking for a good quality neutral eyeshadow palette that contains lots of shades thats an absolute bargin Makeup Revoultion have got you covered. 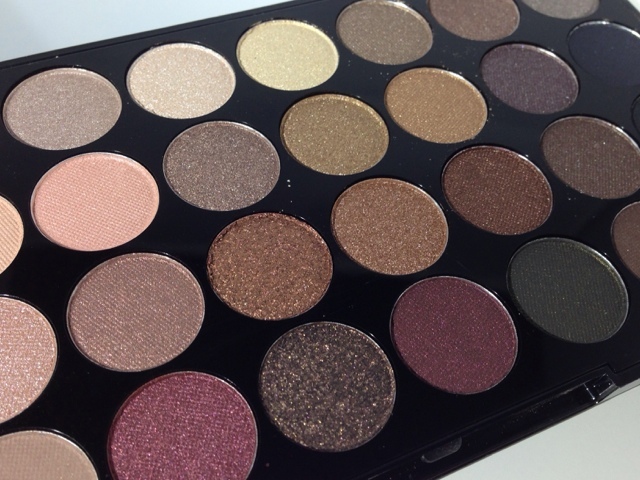 Will you be buying this gorgeous palette beaut's?? I'd love to know. I'm trialling two different palettes from Makeup Revolution and the pigmentation is brilliant. They blend beautifully too, but they do come up a slightly different shade on the lid than they are in the pan. makeup revolution have really got my heart at the moment, I adore them :) Im so tempted with one of these palettes, makeup revolution are so good. This is all you need for your eyes in one palette! It looks very pretty! I was looking into getting some of the palettes. They seem like such a great deal! The whole palette looks great but there are a couple of purple shadows there that look simply stunning. What a great deal! I NEED THIS SO BAD! I so need these in my life!! Lovely post!! Holy mother of makeup, that is beautiful! Seriously, I'm going to end up buying everything Make Up Revolution make at this rate! WOW. It looked a lot more expensive. The eye shadows are gorgeous. I think I need to get my hands on this .